Today is Gary Larson’s 62nd birthday. Gary, if you are reading this, many happy returns of the day to you. For the rest of you, I want to talk about something amazing that involves Gary Larson, his comic strip “The Far Side”, and paleontology. I’m not going to explain why this is funny (it is), but I am going to tell you something funny that happened after this comic was published. 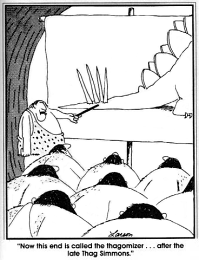 By chance, paleontologist, Ken Carpenter, of the Denver Museum of Nature and Science, saw the comic and used the term “Thagomizer” when describing a fossil at the Society of Vertebrate Paleontology Annual Meeting in 1993. Since then, Thagomizer has become the informal anatomical term referring to the arrangement of four spikes on the tail of a dinosaur and has been used by other illustrious sources, like the BBC. The thing that amazes me in all of this is that Larson, a cartoonist, has influenced the study of paleontology by doing nothing more than pulling a twisted idea out of his head and putting it down on the page. I can think of few things more amazing than having something that I have created influence someone else. I can only aspire to follow in such footsteps. My hat goes off to you Mr. Larson. Thank you for your contributions to the multiple worlds of comics, books, and paleontology. ← I am a [smart] fraud. His profound impact on doctors has brought me joy. Our family doctor has his cartoons plastered all over the walls. I’ve heard that the number of Dilbert cartoons in a cubicle setting is directly proportional to the level of unhappiness in that cubicle environment. Maybe the number of Far Side cartoons in your doctor’s office suggests that your doctor is a “mad doctor”. If your family doctor starts suggesting things like replacing your children’s limbs with chicken parts, maybe you should start looking for a new family doctor. My favorite one is the one where God is about to push the “smite” button. Very appropriate, given the topic of your recent novel. I think of The Far Side often. I love the one where the pilots are creating turbulence. Also young Moses parting his milk. Gary Larson is a genius. I had no idea that he influenced even paleontologists. How fitting!!! !